Many anxious youth struggle with the uncertainty of life. This is especially true for children and teens with generalized anxiety disorder (GAD) and panic disorder. These youth are afraid of the unknown, often believing that terrible things are likely to happen and that they will be unable to cope. As a result, these children and teens strive for predictability and certainty at all times, becoming anxious, rigid and irritable when they are asked to manage the unknowns or “go with the flow” as the expected becomes unexpected. Yet, life isn’t predictable and there are no guarantees. 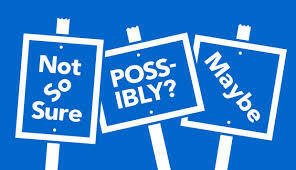 Searching for this elusive “ghost of certainty” only leads to more worry and doubt when the certainty fails to appear. The first step is to talk with your child and explain that the search for absolute certainty is futile. Use examples from your own experiences to demonstrate how uncertainty is everywhere and there is no “sure thing.” For example, remind your child of a recent time when the weather forecaster predicted rain but the day was dry, or your teen was certain she failed an exam but passed with flying colors. ​You will not have to look far to find personal examples. ​These examples will help your child understand that learning to live with uncertainty is a critical skill. 1. 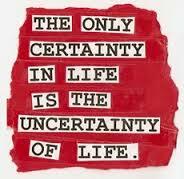 Bad things will happen with uncertainty. 2. I won’t be able to cope. ​​​Like any exercise or experiment that involves facing a fear, it is important to start small.